← The Joys of Suet! Via the Internet Wayback Machine this little snip-it of old time country life is some of the useful knowledge our high tech culture has lost. Originally posted on Al Durtschi’s unfortunately defunct The Old Timer’s Page sometime in the 1990s this is how Gordon Schaufert (born 1942) remembers his family keeping pork edible by processing it in a crock and covering it in fat. Meat potting is preserving meat in it’s own grease in a large crock pot. This is how we did it. Early in the morning Dad killed a pig and started cutting it up. He gave the pieces to Mom who had the wood stove in the kitchen hot and ready to cook. She started frying the pork and prepared the 10 gallon crock pot. 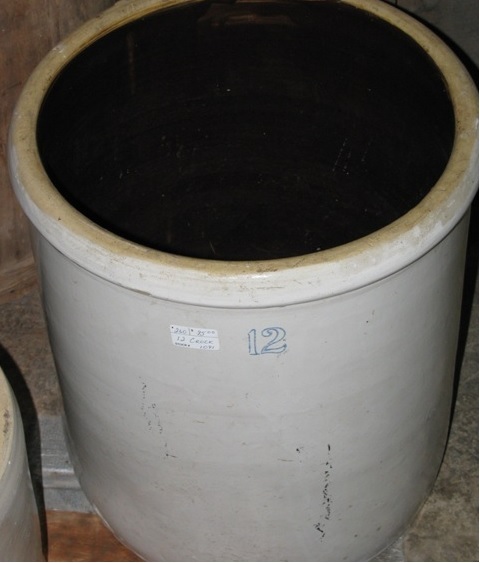 This pot was about 18 inches in diameter and 24 inches deep. Mother washed it, and got it just as clean as she could get it. As the pork fried, it gave off lots of grease. She took some of this very hot grease and poured it into the bottom of the crock, sealing and sterilizing the bottom. Then she put the meat she had just finished cooking down onto this grease. As she continued to cook throughout the day she added the well fried meat and covered it with the hot fat that came from the cooking process. By the evening the pig was all fried up and in the pot, covered over with a nice layer of lard that had hardened. As the days passed by, we dug down into the lard to where the meat was, pulled out what we needed, and put it in the frying pan. We cooked it good a second time to kill any bacteria that could have possibly gotten into it. Doing this not only re-sterilized the meat for eating, but melted off all the excess fat. The meat was taken out of the pan and the fat was poured back into the pot to seal up the hole we had just made getting the meat out. There’s some follow up q&a to help people planning on trying this and understanding our history. 1. How long can pork be preserved in this way? 2. How much did you have to cook it to be sure it was cooked enough? 3. What other meats can be preserved in this way? 4. Could meat be salt cured and then potted? Yes, and this was done by some families. It is hard to say how long this extended the shelf life of the meat in the pot. 5. What can I do to enhance my chances of potting safely? There’s a last part dealing with preserving our heritage speaking of which I really wish someone would put Al Durtschi’s site back up before it’s gone forever. This entry was posted in Frugal Living, Old Time Wisdom. Bookmark the permalink. Where can I find an old time crock for sale!!?? I see them sometimes on Amazon.